Click on image to LOOK INSIDE. 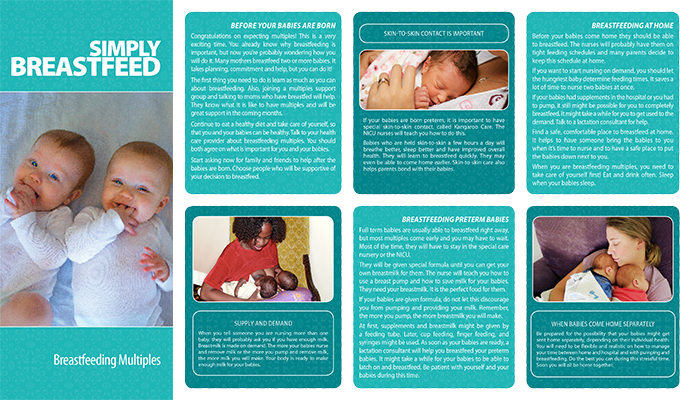 Simply Breastfeed pamphlets give answers to common questions, helpful advice and information on eight breastfeeding topics. Becoming a parent means having to make lots of choices. 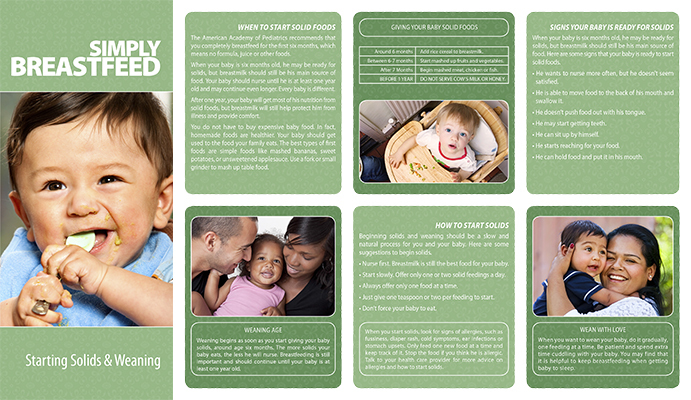 One of the most important decisions is how you will feed your baby. Your choice to breastfeed can make a difference for you and your baby, both now and in the future. As soon as your baby is born, your body will be ready to breastfeed and your baby will have the instinct to nurse.That doesn’t mean breastfeeding will always be easy. It might take some practice before you feel like you know what you’re doing. 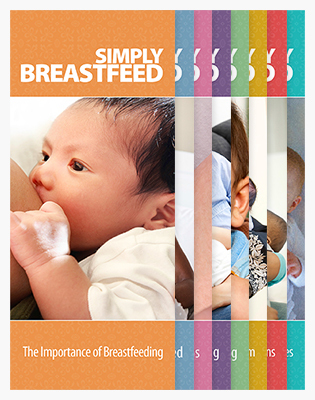 After the first few days and weeks, breastfeeding will become easier for you and your baby. Breastfeeding is natural, but it isn’t always easy at first. You might have some problems that make it difficult. 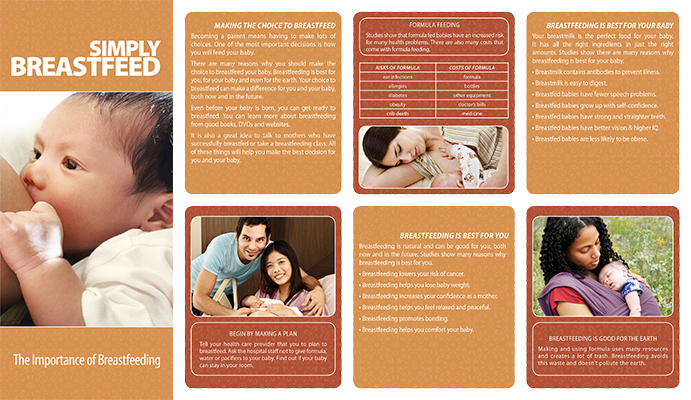 Once you overcome your problems, breastfeeding becomes easier and will be a very sweet and rewarding experience. When you have to go back to work or school, you do not have to quit breastfeeding. You can work and breastfeed, too. Breastfeeding and working takes patience and commitment, but it can be done and it will be worth it. 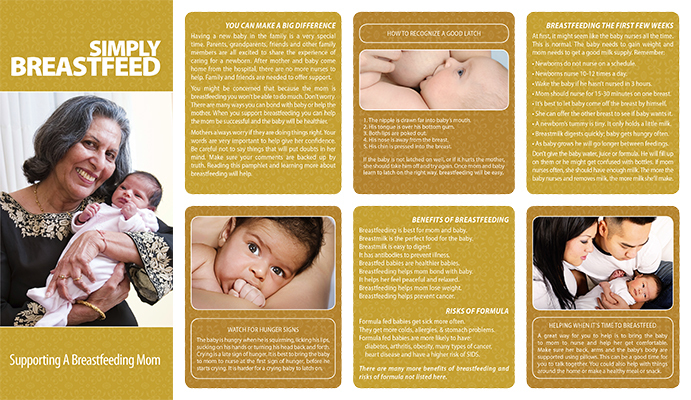 When your baby is six months old, he may be ready for solids, but breastmilk should still be his main source of food. After one year, your baby will get most of his nutrition from solid foods, but breastmilk will still help protect him from illness and provide comfort. Having a new baby in the family is a very special time. Parents, grandparents, friends and other family members are all excited to share the experience of caring for a newborn. 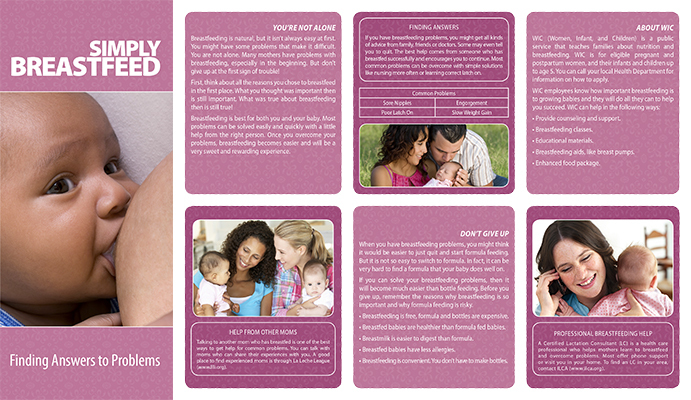 When you support breastfeeding you can help the mom be successful and the baby will be healthier. Many mothers breastfeed two or more babies. It takes planning, commitment and help, but you can do it! Some English titles out of stock. Call for availability and print on demand quote.